The kids are almost out of school, and you can just see it in their eyes! To them, each day is a new opportunity to stay in their pajamas until the afternoon, play video games and eat you out of house and home! Your children may need a few months to unwind and relax, but when they spend hours of time in front of the television, this may be an indicator that they’re bored. It’s possible to indulge their need for regrouping and relaxing while still keeping them stimulated and engaged. 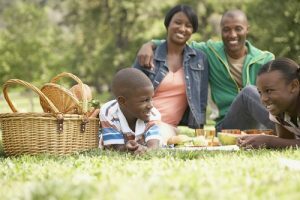 These activities are sure to give them some lovely, lazy summer memories, while still keeping them focused and active. 1. P ut together a creative picnic. Make a few sandwiches, throw some fruit and a couple of cookies into a bag, pack a blanket, some sunscreen, some floppy hats, and head outdoors. But those aren’t the only supplies you’ll need for this picnic… Pack colored pencils and a pad, some writing paper and pens, and maybe even some clay or craft supplies. Encourage your kids to create something inspired by the natural world around them. Maybe even join in on the creativity yourself! Got a few old pillow cases? They’re perfect for a backyard potato sack race. Grab a couple of eggs and spoons, and you’ve got an egg race. Pick up a few prizes at the dollar store, and get your kids jumping, wobbling, and wiggling their way across your yard for a day of silly games and prizes that will have them bragging to their friends. Okay, hear us out. On a rainy day, it’s tempting to stay inside and watch TV with the kids, or let them get lost in a video game. Maybe, if you’re feeling adventurous, you’ll take them to the mall. But you know what’s really adventurous? A walk in the rain. Put on your galoshes, head out without your umbrellas, and let your kids know that it’s OK to get wet. See the leaves turn glossy and the sky grow dark, and jump in a puddle or two. You’ll know you’ve really gotten into the spirit when your kids are rolling in the mud in the backyard, and you don’t mind the laundry and baths afterward. No one likes turning on a hot stove in the stagnant heat of summer. Cooking on a stovetop or using your oven is not an activity you want little fingers involved in either! This summer, cook dinner with your children by making some no-cook dishes that require no heat. Talk about fruits, veggies, herbs, and spices with your children. Do you shop locally? Tell them a little about where each ingredient came from, and how fresh your food will taste since you’re eating local, in-season foods. Check out some great ideas for no-cook dinners. 5. Hold a nature scavenger hunt. Children love scavenger hunts, and this is a great way to teach them about their local flora and fauna without inducing yawns and eye rolls. Buy a few books that display pictures of birds and plants in your area, and cut out the pages so that they’re displayed, flashcard style. Go to a popular hiking area and wander the woods with your kids. See who can spot a sparrow, a fern, a chipmunk or a maple. Collect a flashcard each time the animal or plant on the card is spotted. At the end of your hunt, review the cards with your children, who will be excited to talk about exactly where they were when they saw that bright red cardinal. It’s not impossible to relive the kinds of lazy, relaxed summer days of your youth with your own kids. You can find activities to keep their minds engaged, so that when they return to pre-school or kindergarten in the fall, they’ll have the kind of momentum they need to fall right back into daily learning!